Whispermat™ Floormat is a single layer of open or closed cell foam, typically ¼"(6mm) or ½"(12mm) combined with a barrier. The exposed surface of the barrier has a durable wear resistant surface layer which is combined to it during our proprietary manufacturing process. Whispermat™ Floormat has 25 years of proven performance under the extreme conditions as military and off-highway vehicle floormats. The wear resistant surface layer is a vinyl material molded in a choice of two available hard wearing patterns that provide a non slip floor surface. The vinyl surface layer is an unloaded vinyl material which does not show scuff marks and is color fast under heavy foot traffic conditions. • Other material composites are frequently employed to meet specific application requirements. 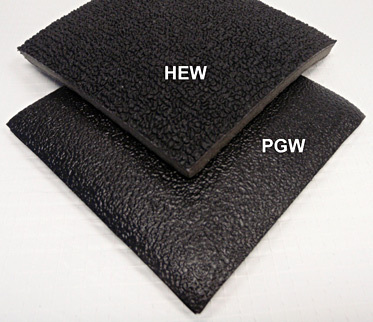 • HEW - has a deep twist grain wear surface to stand up to heavily traveled and severe environments. 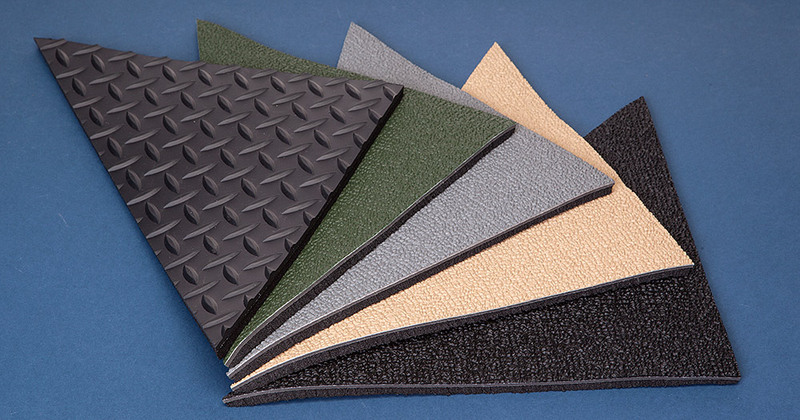 Standard applications are in trucks, transit vehicles, construction equipment, military vehicles and agriculture machinery as well as for runners and fatigue mats.